A research complex in Mojave, California. A demonstration/experiment is taking place. A new weapon, utilising alien technology, has been developed and is being tested. The device is activated. 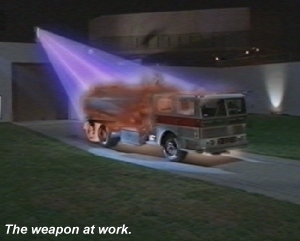 Outside, a huge truck disappears in a glowing ray of light. Back inside the complex, the experiment is a complete success – except for one thing. There is a minor overload resulting in a power drain at the mysterious “Complex 9”. Inside “Complex 9”, a tiny child in an incubator opens her eyes. As the power fluctuates, the girl looks across the cavern. Behind a laser-intensified shield, a Tencton is slumped on the ground. As the power fluctuations continue, the Tencton gets to his feet. He is huge in stature and doesn’t understand the nature of the laser beams. He only knows that he must get to the girl. He reaches out but is burned by the lasers. He reaches out a second time, and is burned again. His third attempt coincides with a secondary power failure and the beams vanish. The giant lumbers across to the girl and retrieves her from the incubator. Although the child appears to be Tenctonese, she doesn’t sport the familiar cranial markings of the typical Newcomer. Through what appears to be silent instructions from the girl, the giant exits the cavern with the child in his arms. Once in a corridor, he lumbers awkwardly towards the external wall of the complex. With little effort, he bursts through the exterior concrete wall as though it was made of paper. In the free air, the child (again silently) instructs the giant to create an opening through the electrified fence – safely. Guards and dogs are soon on their trail but the giant instinctively knows that he is racing for their lives. Inside the complex, the human in charge issues orders to begin a helicopter search. Then he turns towards an aged and frail Tenctonese. It’s late at night in Matt Sikes’ apartment. With the aid of a romantic film, he and Cathy Frankel are attempting to get to know each other a little better. Unfortunately, and despite warnings from Cathy, Matt gets a little over-enthusiastic. The Giant and the child have been tracked down by the helicopter. The girl realises that it is because of a homing device in the bracelet that is attached to the giant’s wrist. The giant disposes of it, but it is too late. Taking many bullets, during which time one guard is killed, the Giant struggles over an alley wall but he loses contact with the girl. The armed guards attempt to retrieve the girl but are scared away as police cars race down the alley. The next morning, Matt arrives at the precinct together with extreme pain and a severely crooked neck. George guesses what happened but Matt laughs it all off as a bar of soap that he slipped on in the shower. However, even Albert realises the truth. Matt still protests his innocence when Albert grasps his head and administers an appropriate form of medication. Able to move his head, but still sore, Matt thanks him. Matt and George are put on the case of the skirmish in the alley from the previous night. George recognises that one of the guards worked for Dr Tivoli – a remarkable doctor, nobel prize winner, and an idol of George’s. Matt’s never heard of Tivoli. Albert is checking on the children in Daycare. He sees the strange child there and suddenly finds himself overwhelmed with disturbing mental images. As a Binauum, Albert is particularly sensitive to psychic thoughts. A short while later, George and Matt are questioning Dr Tivoli about the dead man. George is in awe of the woman but she is of little help to them. However, unnoticed by the two detectives, Tivoli is remarkably interested in the girl and she offers her services, as an expert on genetic research, to examine her. The following morning at the Francisco house, Susan is concerned about Buck. She points out to her husband that their son is spending all of his time studying. While George suggests that there’s nothing wrong with Buck developing a “keen intellect”, Susan feels he’s missing the point. She goes onto explain that, at his age, Buck’s only friends are male and that he has no “outlet”. George goes on to point out that he was a “late bloomer” himself but Susan feels that he is avoiding her meaning. She asks if George spoke to Buck about not letting his “akla-fluid” build up and George quickly answers “Yes, years ago”. Susan isn’t convinced and suggests that he speaks to Buck again – however, George appears hesitant. Buck answers a knock at the door and finds Matt has arrived to drive George to work. Matt tries to laugh off his painful neck only to have Buck snap at him before racing off. Susan calls after her son as Matt asks what he did wrong. Susan notices Matt’s neck, too, but doesn’t mention it. Rather she settles for directing Matt towards George in the kitchen. 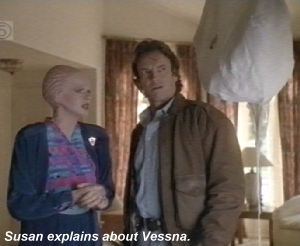 After confusing Vessna’s cheerbusha with an infestation of the house, Matt talks to Susan about Cathy’s suggestion of going to classes. However, Susan agrees that the classes are a good idea – otherwise Matt could end up with “permanent damage in painful places”… Matt is deep in thought as Susan leaves for work. …somewhere on the street, the Giant finds himself being purposefully drawn in a particular direction. He’s looking for something. 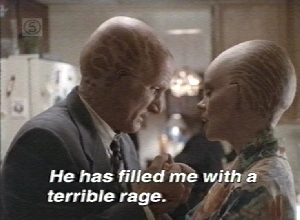 Back at the precinct, the Captain comes to the conclusion that the child is a human/Tenctonese hybrid. Matt doesn’t believe that’s possible but Cathy tells him that Tenctonese have been known to “genetically adapt” within one generation and that “interbreeding” is just a matter of time. Despite the examination not being sufficient for Cathy to make a final decision, the Captain has already made up his mind that this is a hybrid. 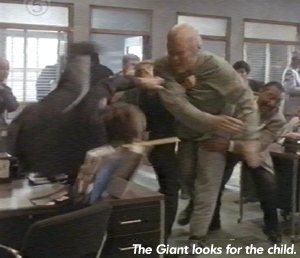 The Giant has reached the police station and he is, seemingly, going berserk when, in truth, he’s trying to reach the child. As Matt and George reach the ruckus, they see the Giant hurling police officers aside with no effort whatsoever. Matt immediately offers his help and launches into the affray, only to have the Giant toss him across the room with one hand. Realising what he must do, George runs to the Giant and leaps onto his back. With the Tenctonese equivalent of a sleeper-hold, the Giant collapses to the floor. As the Giant “sleeps”, Matt joins Cathy to register for their classes. Meanwhile, across town, at a theraputic Tenctonese pool, Tivoli receives updates that the child hasn’t been found. Before she can let her anger get the better of her, she (and her contact) are shot. Investigating, Matt and George discover another link to the same company, Dexter Pharmaceuticals, that the original dead guard worked for but George is distraught that his idol has been murdered. That evening, Matt and Cathy go to their first class but, on the doorstep, they find angry protestors of both human and Tenctonese. Each have their own reasons why the I.S.P.L.A. (InterSpecies Project, Los Angeles) is a bad idea. Cathy and Matt ignore the shouts and go in. 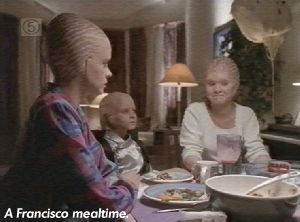 At the Francisco household, Susan is having no success in getting the child to eat. George tells of Albert’s “connection” with both the child and the Giant and that he fears that they came from the ship’s mysterious “Special Section”. 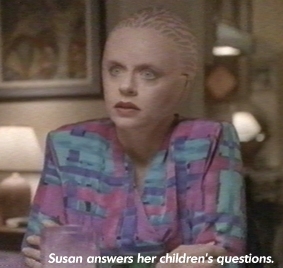 Susan hopes not and Emily questions whether the child’s parents are Newcomer and human. George isn’t sure. This topic of conversation provokes an outburst from Buck concerning Matt and Cathy’s relationship. George suspects he’s jealous but Buck expresses concern for the future of the Tenctonese if they procreate with humans. Emily is confused so Susan postulates a possible future. In generations to come, humans and newcomers could evolve into a whole new species. This gets Buck even more concerned because he suggests that the resulting species will be closer to humans than Tenctonese and would, thus, set back the Tenctonese race back by a thousand years. The meal ends with a touch of name-calling between brother and sister. The following day, Cathy is concerned about the child who seems to be getting weaker. George comments that “Even Susan couldn’t get her to eat”. Albert brings the Giant and the child together. As soon as they touch hands, both seem to draw strength from the other. Albert receives more frightening images from the Giant. When the Giant and child are separated, due to Federal orders, the Giant gets highly agitated. 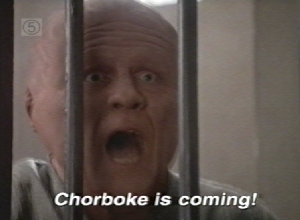 He calls out in blood-curdling terror that “Chorboke is coming!” and this has an immediate effect on both Cathy and George – but then the Giant is subdued by a tranquiliser dart. Matt asks George about Chorboke and George goes on to explain that on the ship there were stories of slaves disappearing; of unspeakable experiments in “Special Section”. The Newcomers had believed that Chorboke had died in the crash but it seems that the Giant might be part of such an experiment. Despite Federal orders to the contrary, Cathy has secured the child in the hospital. However, all signs show that the girl is getting weaker and weaker. Cathy is afraid that she will die. Later, Matt and George question Tivoli’s daughter. They learn that Tivoli was “Kleezantsun/” (an Overseer) and George is furious that he had held such a person in high regard. On the ship, Tivoli had worked in “Special Section” and was known as Vesant – Chorboke’s second-in-command. The daughter reveals that Vesant had been working on a method to separate the Tenctonese mind from their body in an effort to promote a higher state of being. She gives them a name of someone who worked with Tivoli. However, back at the precinct the name of “Benson” reveals nothing but classified warnings. Receiving a call from the I.S.P.L.A. (where Cathy had gone to the second class alone after Matt had chickened out), Matt is told that the demonstrators there are turning nasty. He rushes to the building and is shocked to see Buck as part of the Newcomer crowd. Matt rescues Cathy from a bomb scare but Cathy realises that Matt had lied to her to get out of the class. She tells him that he must decide whether he wants to make the same commitment to her that she is willing to make to him. As George finds a little information on “Benson”, he is told by the Captain that they’ve been ordered to stop investigations and that the Feds are going to take over. George is to hand over all of his notes. George realises that the Feds are trying to cover something up. 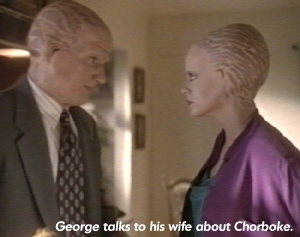 At home, an overwrought George is comforted by his wife. Buck tells them that George’s car is still being fixed and so the following day, Matt drives George to work again. During the journey, the two detectives are attacked. George is taken to a darkened room and told that if he doesn’t leave the investigation alone, his wife and children will be killed. Scared beyond fear, George tells Matt what happened. As George hands over all casefiles and disks to the Feds, Matt is working fast to ensure the safety of the Franciscos. Cathy is, in the meantime, examining the Giant (against Federal orders). She determines that the Giant, also, has only one heart. As George says, “Just like the child.” Then Cathy reveals the results of her other tests – the child is really thirty years old, and she would have been on the ship. Cathy goes on to explain that the child and the Giant are genetically identical-twins. Between them, Cathy and George determine that the Giant and the child must originally have been the same person. Tivoli must have been carrying on Chorboke’s experiment where the child is the “ultimate brain” and the Giant is the “ultimate slave”. Without each other, both will die. George returns home to check on the safety of his family. What greets him is so many police friends and colleagues, armed to the teeth. He is touched by how everyone has rallied round to help protect his family. Inside the house, Buck talks with Matt. He has seen how much Matt is doing for George and his family. No other human would treat a Newcomer with such friendship and respect. Matt tells Buck that his father is a “hell of a cop”. Slowly, Buck begins to come to terms with what he is learning but he is still upset that the future might mean the end for his species. She tells him that she shares the same rage that he has and George tells her that he would die before he would let anyone hurt his family. At the Bureau of Newcomer Affairs Matt and George work their way inside under the pretence of being the bomb squad responding to a tip off. Heading towards the main computer, George searches for information. However they keep coming up against restricted access under the codename “OPSIL”. Matt suggests they search the e-mail. There George finds a message relating to the disposal of documents referring to Tivoli – dated the day after she was murdered. On a hunch that the documents might not have been destroyed yet, Matt discovers some files. Leaving the B.N.A., George reads the files as Matt drives. OPSIL (or “Operation Silence”) is a project in which the Government enlisted all Newcomer scientists – whether Overseer or not. Benson and the C.I.A. saw that they got new identities in return for their work. Benson then left the C.I.A. to set up his own business where he put these scientists in prominent positions. The C.I.A. are now keeping it quiet because they wouldn’t admit to letting these “war criminals” get away. Matt surmises that the whole conspiracy will be overturned by the documents they possess. 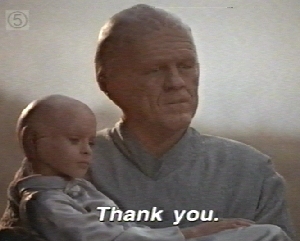 George agrees but realises this won’t help the Giant and the child. With the Giant assisting them, the race is on to save the child as another weapons test is being prepared. During the rescue attempt it is revealed that Chorboke is still alive but that the most skilled plastic surgeons have transformed him into Benson who was killed a long time ago… George must battle face-to-face with his most terrifying adversary! Isn’t it rather strange that every computer in the precinct seems to be turned off..? Or do they all have computers that “blank” the monitor after a period of inactivity? (As someone who works in an office, I know this to be an impossibility because the first thing non-computer literate people do when faced with a computer is to spend hours trying to find the silliest screensaver!) When a computer is finally used, it is pleasing to note that Windows 3.1 has a recorded place in history (“Body & Soul” is supposedly set in 1999). This is very reminiscent of a scene in Michele’s film The Colony in which the teacher at the school explains to the new parents that all of the children have their own computer to use – a P100 – which she says in such a way as to make it sound awe-inspiring. Okay, so maybe it was good in 1995, but today it’s just hilariously dated..! Despite using a Windows 3.1 based system, it’s interesting to note that the program used by George belies its 1995 restrictions. Body And Soul is a hugely entertaining film. Stunning special effects, breathtaking visuals, and perfect music make this a film that should stand out from all others. The storyline is sufficient to carry the film to its full length with just the right clues to what’s really going on given at just the right times to carry the interest without requiring shock tactics. But what of Michele Scarabelli? 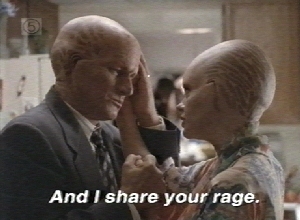 If the film has any faults at all, it is that Body And Soul isn’t quite as “alien” as perhaps it should be. There are many alien/Tenctonese aspects but really, when it comes down to it, we’re looking at a film that deals with genetic experiments and that really doesn’t warrant the uniqueness of the Tenctonese. The unique alienness of the film is, like most of the series, subtly moved onto the secondary storyline of Matt and Cathy. Because of this, not enough screen time is given to the rest of the Francisco family – and this includes Michele’s Susan. Even Buck who is given the strong character of concern for the future of his species is given insufficient time to put across his worries. Susan’s only role in this film is to answer Buck and Emily’s questions (which turn out to be unanswerable anyway) and to comfort her husband. Like Lauren Woodland’s Emily, Susan is very much underused – although it is great to see her preparing for work in her first scene (even though, if you watch this as a standalone film, you wouldn’t realise that this is what Susan was doing!). In this way, Susan gives to the film a sense of continuity with the series but more continuity is already being provided by Matt and Cathy’s relationship anyway.